Happy Columbus day. I hope those of you that had this holiday off, enjoyed your day. 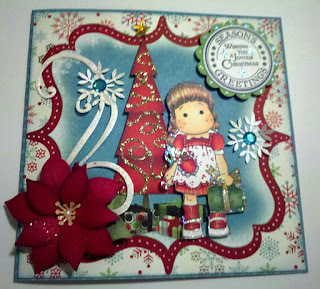 Today was rainy and cool here, so it was the perfect day to stay in my jammies and do some card making. It's been a while since I've had a chance to play with my maggies, so this was a much needed day for me. As always thank you for stopping by and for the wonderful comments. They are so appreciated. Adorable!!!!! This is so beautiful. Love this card. that is really cute great job ! Very sweet. I like what you did with her apron and the touch of glitter is a great finishing touch. Love everything about your beautiful card. Love you card...the sparkly snowflakes are a great touch too! Gorgeous creation, love the colour combo and the design is amazing. Beautiful card. Beautiful card! I love the scene you created for the holidays. 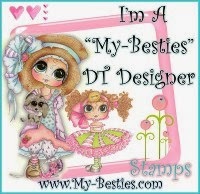 Lovely distress elements! Thanks for joining us at Stamptacular Sunday! Hugs, Marcy K.
This is precious! I love the colors that you used. Fabulous card! Love the dimension you've created and the shapes you have used. Beautiful color combo and sweet Tilda!!! WOW your card is absolutely beautiful. I love your color combination and all of your details are perfect. It's good to see you crafting again! Julie, your card is gorgeous. Beautiful colouring of this adorable Tilda. Love the traditional Christmas colours. I love the shape of your centre panel. Pretty DP. Just gorgeous Julie. I love the colors you have used here, and really love the red tree. I am so literal, I would never have thought to do that. Really looks fabulous!